Click the image above to view larger. Download a PDF. 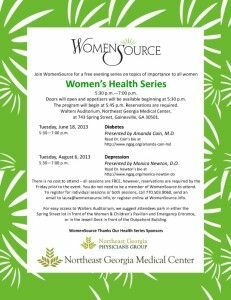 WomenSource is hosting a free evening health series on diabetes Tuesday, June 18, 2013 and depression Tuesday, August 6, 2013. Both evenings are 5:30–7:00 p.m. in Walters Auditorium at Northeast Georgia Medical Center located at 743 Spring Street Northeast, Gainesville, Georgia 30501. The Health Series, sponsored by Northeast Georgia Medical Center and Northeast Georgia Physicians Group, will feature Amanda Cain, M.D. (bio at http://www.ngpg.org/amanda-cain-md) discussing diabetes June 18 and Monica Newton, D.O. (bio available at http://www.ngpg.org/monica-newton-do) discussing depression on August 6th. Doors will open and appetizers will be available beginning at 5:30 p.m. The program will begin at 5:45 p.m. Registration is required by the Friday prior to each event. To register for the health series call 770-503-9060, email ofni.ecruosnemow@arual or register online at www.WomenSource.info. All sessions are are free and membership in WomenSource is not required. For easy access to Walters Auditorium, WomenSource suggests attendees park in either the Spring Street lot in front of the Women & Children’s Pavilion and Emergency Entrance or in the Jewell Deck in front of the Outpatient Building.